Notes: First, can we get this part out of the way? SQUEEEEEEEEEEEEEEEEEEEEEEEEEEEEE! 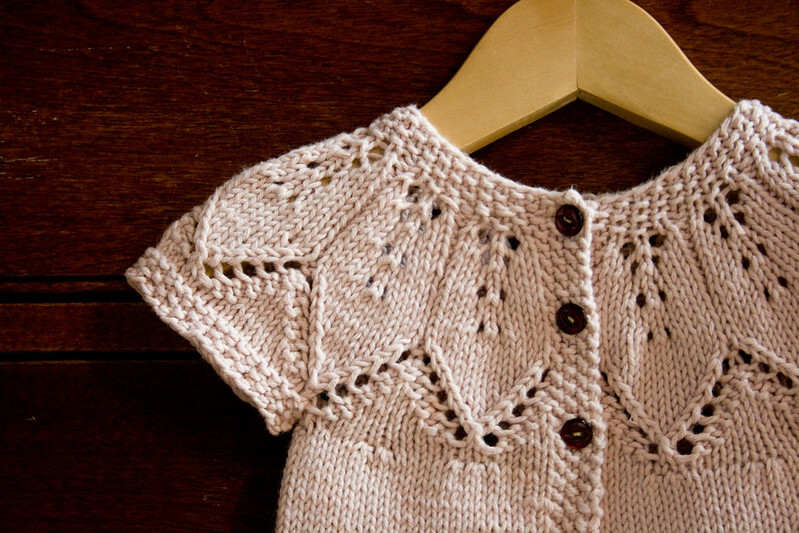 The concept and finished sweater are just as darling as their recipient, whom I haven't met yet, but will soon. 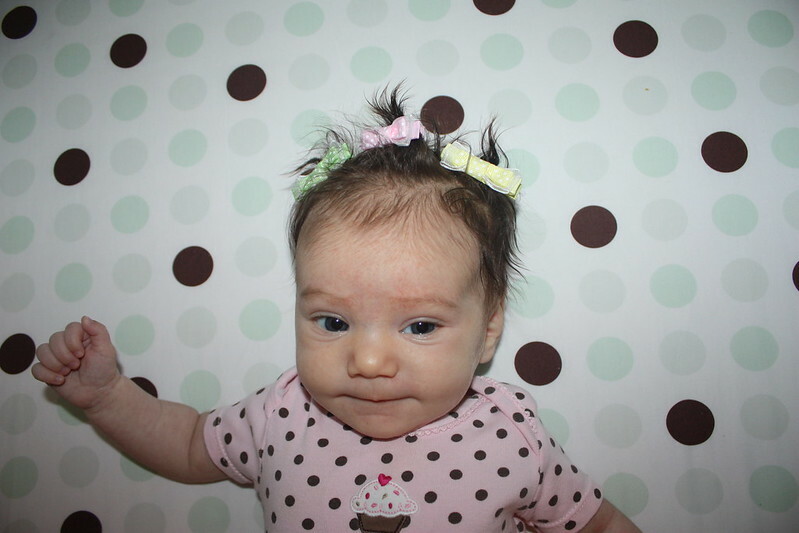 She's my dear friend Jenny Narcoleptikov*'s 2-month old daughter, Emma. Jenny already has a son, the very entertaining Connor, but you could just tell she was dying to acquire a collection of froofy headbands with which to adorn an infant girl. Jenny's that kind of lady. So something wildly darling was in order. cute sweater . . . hey, there's the debit card I melted in the dryer! There's another issue though, which could contribute to this sweater looking tight on America's baby girls. The pyramid shaping that results from the pattern as written is awkward, and results in a narrow chest and weirdly disproportionate (yet somehow still small) sleeve openings. Also, for some reason the back and front of the sweater were not nearly an even number of stitches. You sometimes see this when you're attaching a separate button band later, but the button band is integrated in this pattern. Plus it meant the flower motif in the yoke wasn't centered over the sleeves. ANYWAY. Did I say I tried not to be too hard on free patterns? Constructive feedback! Thankfully when you're working on a teeny sweater that ends up being kitten-sized, you haven't wasted much time when you decide to redo it with modifications. Main modifications: First, I did all the increases in the chest in one row, spaced out every five or six stitches. I ended up increasing at least a few stitches more than the pattern suggested (sorry, I wish I'd taken more specific notes! but you get the idea). For the record, this came out to about 18" in chest circumference after blocking. Second, I redistributed the number of stitches in the front and back to even things up and center the pattern over the sleeves. I did this by shifting some stitches from the back piece to the front, and casting on a couple of additional stitches under each sleeve. The modifications here were a guide, and give some specific numbers. And finally, I used only three buttons. This is a summer sweater, made of cotton, not something to bundle up in, and an open cardigan will give some extra room. Oh also I worked the sleeves in the round, but that goes without saying. This is a "Summer Petals" cardigan instead of "Autumn Leaves." I chose cotton yarn so Emma could have something to wear right away, and because this delicate ballet-slipper pink seemed too perfect. 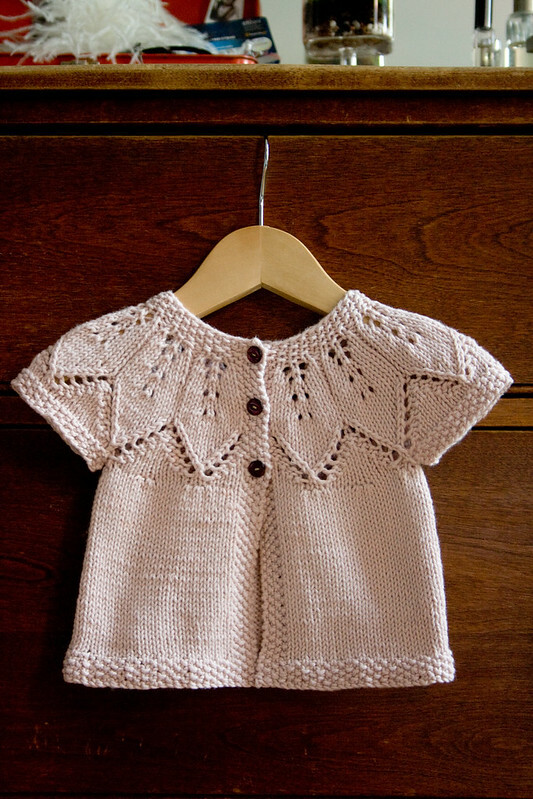 Sublime Organic Cotton DK is simply my favorite cotton yarn for baby gifts. I just learned as I write this that it has been discontinued, which is a bummer. This yarn comes in amazing soft colors that are baby-flattering pastels without being cloying, and for a cotton yarn this stuff is really not splitty. I'm going to have to start looking around for the stuff and hoarding it. So forget I said anything! It's terrible, don't buy it! 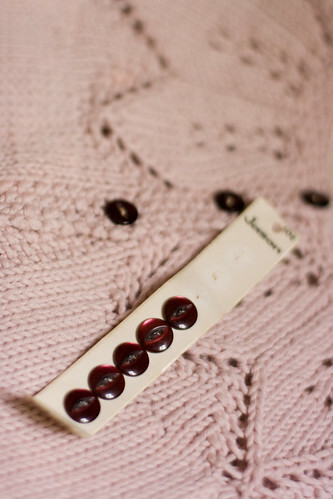 The buttons are vintage, a gift from my thoughtful mother-in-law, who has a great eye for findings! I'm starting to rely on her for my supply. * Jenny earned the nickname Narcoleptikov years ago by falling asleep regularly in public places. 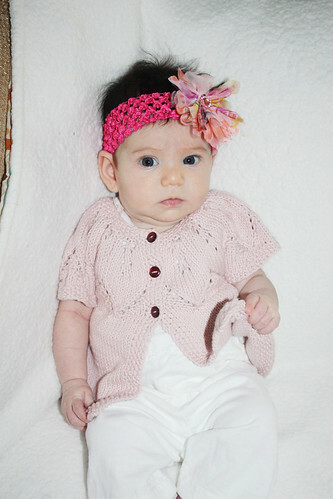 ETA: Here's Baby Emma modeling her new sweater. I'm relieved that it still fits!! Kitten-sized cuteness! I have also used the Sublime Cotton DK for baby gifts are really like it a lot and am chagrined to learn it's being discontinued!! Love this! 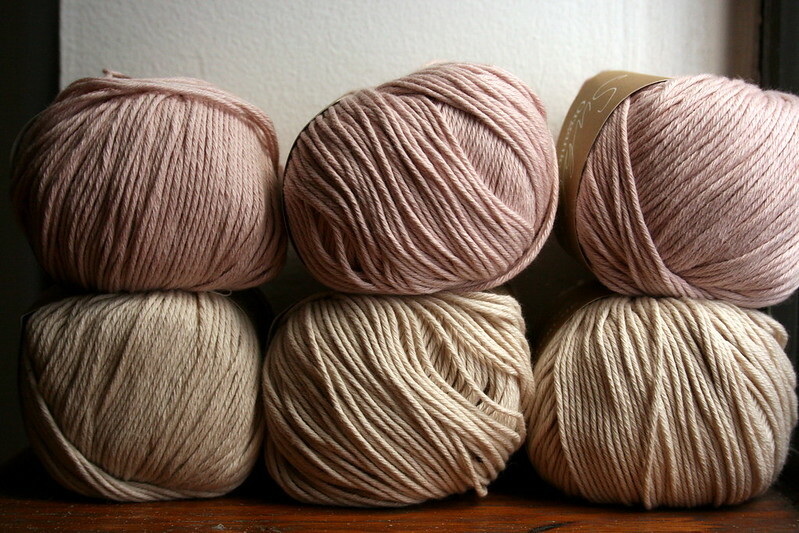 And I love Sublime Organic Cotton - so sad it's discontinued! I bought up all the pale pink they had over the summer, but Yarnbow has some Maize left, I think! it's so super and she's adorable! That is stunning! I really like your modifications, too. Thanks for sharing! Aww, love it! Both the sweater and the baby are adorable!! This is sooo pretty. Lovely knit dress and lovely baby! I followed the Ravelry version up to the chest increase. As I read the directions I sensed something going wrong. I read your blog post very carefully to see what you had done differently and found your alterations. Your increase is far more sutle than the other version. Adorei este casaquinho, gostaria de obter a receita. Sou tricoteira e gosto muito dos seus trabalhos. Such a beautiful sweater - well done! Any chance you've made it again since your original post, with more fulsome instructions for the modifications? Thanks! I love this sweater !!! I am looking for a pattern for a hat that matches any suggestions? Pretty please enter the code as seen in the image above to post your comment.